One trend I am currently loving is printed pants! And these palazzo style pants from Kaeli Smith Designs are SO comfy! The print on these is cute jewelry. I love it! Of course I wore my white Jack Rogers, so comfortable! I did struggle a bit with what to pair with these poppin' pants but ended up picking this white Calvin Klein sleeveless blouse (similar one on sale here!). I picked this because the material of the blouse and pants are similar, and it just worked better than any of the cotton tops I was trying to work with. Of course I had my rose gold Kate Spade purse in tow, can't go anywhere without that beauty! My Fossil watch (exact one linked here) added a casual vibe to the outfit. A neutral watch is definitely a must have in my book! This weekend hubs and I went to Universal to meet up with some friends. We had a great time catching up and of course visited Harry Potter World! 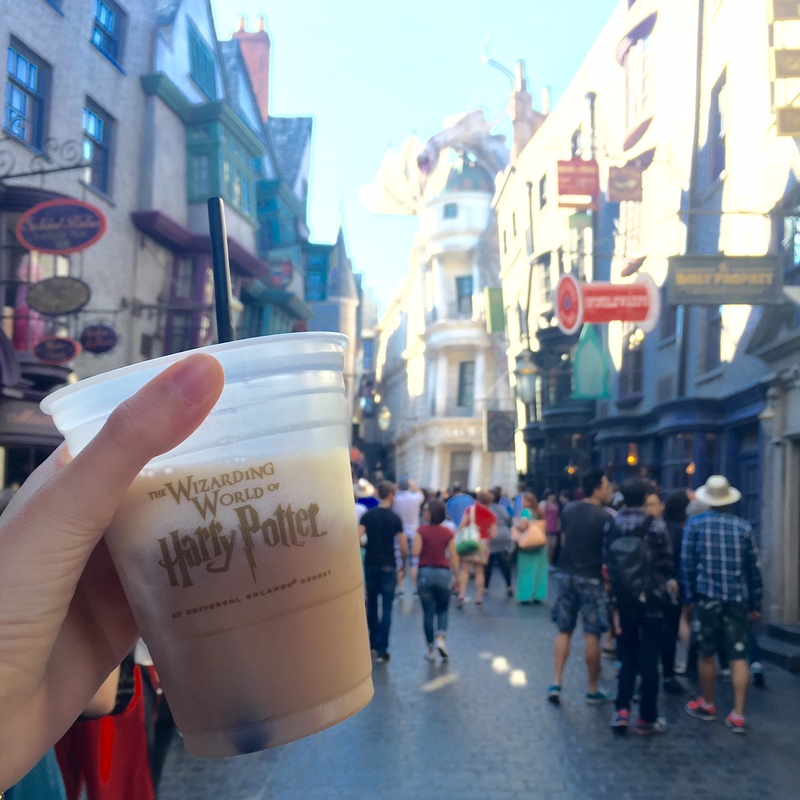 We rode the Hogwarts Express and drank Butter Beer - delicious! I love your pants!! That pattern is adorable! This outfit is so cute, and I really love your bag! I've been wanting to get a small one for a while now, so I've been on the hunt haha! It sounds like you had a really great time, though! Harry Potter World is seriously the best! I love the Kate Spade outlet! They always have such cute stuff for a pretty good price. HP is legit! This whole outfit is just so cute! And you totally made me envious by going to Universal, I love Harry Potter! Thank you Jasmine! Harry Potter world is pretty cool!